Adibolmamalek hotel Yazd which is situated in a cozy place in the historical texture of the city provides a good opportunity to experience a pleasant accommodation. 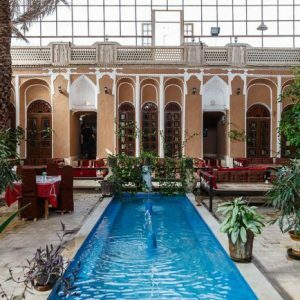 The hotel was originally an old house dating back to Qajar era refurbished to fulfill the needs of large number of domestic and foreign travelers to Yazd. The complex includes various rooms in unique styles such as two-door, three-door, and five-door with satisfying facilities. A splendid hall, a warehouse and a traditional bathroom are also the exciting sections of house. Here, guests can taste a variety of Iranian and Yazdi foods and local drinks in the restaurant and café situated in the yard with a comfortable environment or get relaxed in sitting on the wooden benches and enjoy the architectural masterpiece.